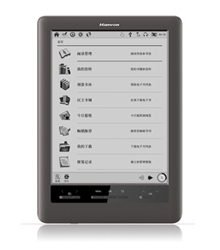 1600 x 1200 resolution – the highest resolution of any E Ink ereader currently available. Hanvon’s special Dual-Touch ERT system lets you use either your finger or the stylus to operate the touchscreen. For faster page turning, simply tap the side of the screen with your finger or stylus to turn to the next page. The stylus doubles as a tool for annotating ebooks and documents as well as taking notes and memos. In the reading interface, use the stylus to add personal annotations and underlines directly to ebooks. Annotations made to PDF files can be embedded to the document and stored for viewing on a computer using Adobe Acrobat Reader. The Memo and Notepad interfaces offer users two choices for taking notes. In Memo mode, users can sketch freehand notes and save them as image files. In Notepad mode, users can convert handwritten input to text, which can be saved as a .txt file. The integrated calendar application can help you manage your appointments and dates. Set reminders to pop-up when an important upcoming event will begin. Search and manage contact information by name, phone number, email, company, address, etc. When you feel like taking a break from reading, take some time to enjoy playing Chinese Chess, Gobang and Sudoku. Less than 2.0mA@3.3v in sleep mode. It can execute more than 10,000 page refreshes on one full battery charge. Main Functions Support: Search, Remark, Autopage, Zoom, Page jump, Rotate screen, Memo, Notepad, etc.